Jolie robe noir profond. Le nez est frais et puissant avec d’intenses arômes de fruits noirs, de café et d’épices douces. Alliant fraicheur et puissance aromatique, la bouche offre une belle texture tannique finement ciselée. La finale est dense, racée et étonnante de fraicheur, grâce aux secteurs en altitude.Un très joli millésime. 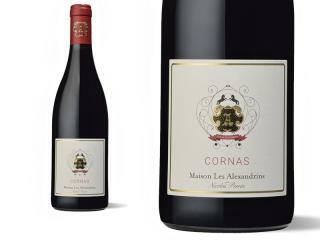 Modest red plum and crushed stone notes mark the 2017 Cornas Maison les Alexandrins, drawn primarily from les Eygats. It’s medium to full-bodied, with rather supple tannins that suggest this easygoing, red-fruited wine should be approachable young. The 2017 Cornas from this estate is a charmer that has loads of red and black fruits, spice, leafy, peppery herbs, and earthy aromas and flavors. Possessing medium to full-bodied richness, terrific purity, and a rounded, already approachable style, drink it on release and over the following decade. This is rich but extremely tightly knotted, and will take six to eight years to fully show off those Mediterranean spices and sweet plum fruits. It’s a little more supple, with more of a typical southern Rhône character compared to the Côte Rotie wines in this tasting. It’s big, generous and gorgeous, made from grapes purchased from two estates on south and southeast facing slopes in Les Eygats. 20% stems kept during winemaking.